Mark your calendars! On Memorial Day (Monday, May 26, 2014) from 9 AM until noon we will be hosting our third annual Warbirds over Conejo event. This free flying event is open to the public, and will be held at the Rancho Conejo Playfields. Come join the Quiet Flyers for a morning of flying fun. Kids and adults will get a chance to fly an RC (remote controlled) airplane and see many varieties of RC aircraft in action. There will additionally be computer flight simulators to test your flying skills, a raffle, and soft drinks available for purchase. Bring the family and have a chance to see what this hobby is all about! The Rancho Conejo Playfields (off Ventu) have been reopened after five weeks of grass renovation. Our regular flying schedule is back in force. The Wildflower Playfield has reopened. It had been fenced off in mid-June for grass restoration. Warbirds over Conejo a success! Thanks to all the members and attendees that helped make the first Warbirds over Conejo a success! Dozens of new pilots, ranging in age from 5 to 75 years old, took the controls for the first time and flew aircraft ranging from 31-inch combat wings to two-meter powered sailplanes, all under the supervision of experienced pilots. Several simulators were also put to use. In addition to multiple flying warbird demonstrations, static displays included WWI, WWII, Korean War, and modern aircraft. One crowd favorite display was a giant-scale F-16 jet. The two combat events, featuring full contact furballs of over a dozen aircraft, proved quite popular (especially with our younger attendees). See our Gallery page for video and photos from the event. A special thanks to Marty's Hobbies for their key raffle sponsorship. Mark your calendars! 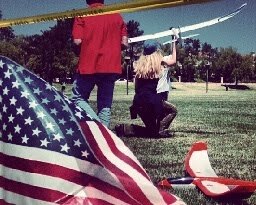 On Memorial Day (Monday, May 28, 2012) from 9 AM until noon we will be hosting a free flying event open to the public at the Rancho Conejo Playfields. Come join the Quiet Flyers for a morning of flying fun. 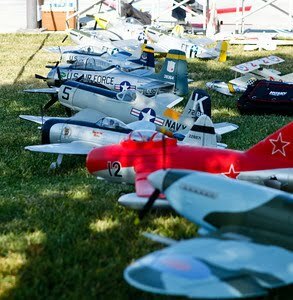 Kids and adults will get a chance to fly an RC airplane and see many varieties of RC aircraft in action. There will additionally be computer flight simulators to test your flying skills, a raffle, and soft drinks available for purchase.